There are many stops to make on the Island of Sodor! Your Wooden Railway engines can visit each of these favorite destinations. 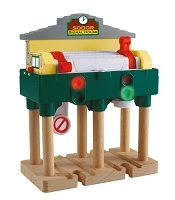 Play out Thomas & Friends™ stories with wooden train buildings, bridges, and accessories below. Compatible with most all wooden trains and track.